HIFU SygmaLift treatment, often referred to as HIFU therapy or simply SygmaLift, is a new revolutionary procedure that can address saggy skin and other common aesthetic problems. Some have likened it to a facelift without surgery due to its effectiveness, but despite its versatility in treating various problems, it is mostly used as a form of saggy skin treatment. But what tends to cause saggy skin? Saggy skin is a natural effect brought on by aging and is not something that is completely avoidable. As individuals grow older, the skin slowly begins to produce less and less collagen and elastin. These natural substances are key to skin appearing youthful and smooth due to its reconstructive properties. The suppleness and tightness of skin is often linked to these substances, and with your facial muscles also weakening over time, the pull of gravity can also contribute to the sagginess of your skin. Overexposure to the sun can also lead to saggy skin, as it damages the skin cells and breaks down collagen and elastin. This leads to an apparent increase in the rate of aging as the skin struggles to recover from the damage caused. Another possible cause is losing too much weight too quickly. This leaves a lot of excess skin and tissue that has been very stretched out over a long period of time and cannot snap back into place. 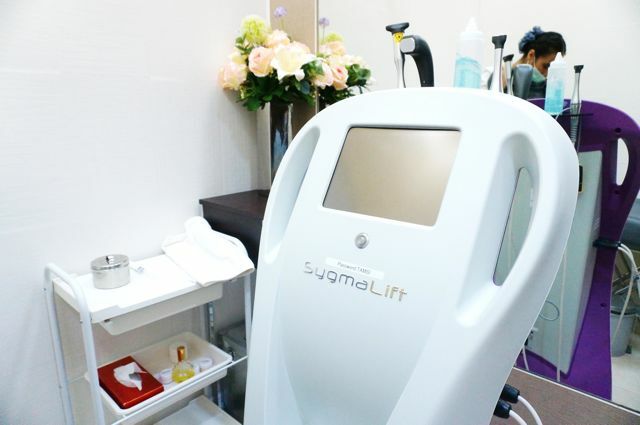 SygmaLift treatment works by utilising high intensity focused ultrasound technology, which is also why it can be referred to as HIFU therapy. The quick emitting laser has an impressive frequency that hits 1,000 times per second, which means each HIFU SygmaLift sessions can be completed swiftly in about an hour or so, making it the perfect procedure to undergo a facelift without surgery. Prior to the procedure commencing, a cooling gel will be applied to make it easier for the laser to penetrate the skin, as well as to minimise any discomfort but the treatment should be mostly painless. The SygmaLift HIFU laser beams will target the skin at specific depths to give a boost to the production of collagen and elastin by the skin. With the laser acting as a catalyst, this also ensures that saggy skin or other aesthetic issues will ultimately be treated naturally by your own skin. This makes it the perfect anti-aging treatment as the results will be all natural, unlike other synthetic treatments with obvious effects. Depending on an individual’s case or condition, our doctors may recommend HIFU therapy at least once a month. As outlined previously, the SygmaLift treatment is perfect for individuals afraid of going under the knife for saggy skin treatment or other benefits such as skin tightening, anti-aging or V-shape face. There is no downtime associated with this treatment, making it a very convenient option even for individuals that are very busy. Sessions can be completed within an hour, so it can also be performed during lunch breaks. Areas where saggy skin was previously prominent will now show signs of firmness and will also be much tighter than before. This gives you a more youthful outlook and can shave years off your appearance; this is also down to the reduction of visible cheek fat. The results of SygmaLift or HIFU therapy can last for up to a year but this depends on the individual and can vary depending on the condition. However, in most cases the effects should last for a minimum of six months. If you would like to schedule a consultation session for SygmaLift treatment with our friendly and professional doctors, do call, SMS or WhatsApp us on +60-12- 6625453 from 8am to 10pm daily. Alternatively, you may also email us at contactus@premier-clinic.com to get in touch!